OK, here we go. This is a detailed review. We are experienced cruisers and have been on many ships on different lines over the past 30 years. RCCL is the one we cruised with the most and are Diamond status, so we’ve had great and not so great experiences over the years – in both regular rooms and suites. This is our second time on Anthem of the Seas (you can look at our previous review from 2016). Service We heard a few complains here and there, but that is expected on a ship this large. We found overall the service to be very good. There were issues in the past with a serious lack of poolside servers, but that has been fixed apparently as there plenty of servers around the pool areas and the other public venues on the ship. The crew is eager to please and waiters go out of their way to make you happy it seems. Even in the Windjammer where they have staff that will get you drinks and quickly clean up after you. Food OK this one is a mixed bag, and the main reason for the 3 star review. Our experience mimics similar experiences on other ships. I am going to break this down as to be clear about how we feel about each type of food service. Windjammer Buffet – This in my opinion is probably one of the best I have experienced out of every ship I’ve been on. The layout, the offerings and the quality are outstanding. Yes there were some duds, but overall it is very well done. Eggs Benedict, smoked salmon and all sorts of baked goods in the morning. Great fish, carved meats and Indian specialties for lunch and dinner. Lots of fresh fruits and vegetables and salads. Seating can be hard to come by at peak times, but there are great floor to ceiling windows for a view and a nice outdoor area in the rear of the buffet. Specialty Restaurants – We dined at Chops Steakhouse and Jamie’s Italian, so we will limit our comments to those two. Jamie’s is excellent. Go hungry – very, very hungry. Definitely start with the charcuterie plank. It’s a long plank of deliciousness. 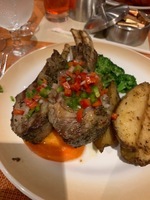 The Lamb Chops are also terrific (Note: I ordered them rare and they came medium-rare/borderline-medium, so order one step less done than you want). Chops Steakhouse was the other specialty restaurant we went too, and is also terrific. They now offer prime aged steaks. 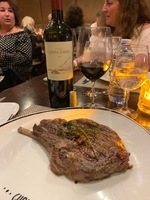 I had the bone-in rib-eye and my daughter and wife had the Branzino. 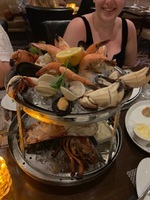 We splurged and ordered the seafood tower. A little disappointed in it and probably not worth the expense. The lobster on it was so undercooked that it was basically raw. Same with a couple of the shrimp (the fact they were black outside and not pink should be a giveaway). The waiter though brought us a new platter of lobster and shrimp to make up for it (note: the last night of the cruise the windjammer has the Jonah crab claws, shrimp, clams, mussels, etc. so you can get most of the ingredients for the tower for free then and skip doing it at the restaurant). But overall experience is great and these restaurant do not rush you. So give yourself 2 hours or so dining to truly enjoy. Solarium Bistro – Probably the least known option, and the best kept secret. This is like a mini windjammer and specialty restaurant combined. There is no extra cost for this dining scene which has great lunch and dinner. We went one night for dinner and they have a great buffet appetizer/salad bar. Main courses are varied, but they have a few extra costs options as well. I ordered the Lamb Chops ($10) which were thick and really good. But as I mentioned earlier, order less cooked than you want it. Mine were ordered rare and came out medium. I was going to send them back, but they were still soft and juicy. I enjoyed them despite the wrong cooking temperature. We also ordered the Maine Lobster for extra cost. This was not worth it. It’s small and extremely overcooked. Desserts were again at the buffet station. Reservations are recommended as it is a smaller venue. But I recommend it, and it is a great alternative to the main dining rooms (see notes below) Main Dining Rooms – Ok, this is where I have some major issues. You have two options. 1) regular dining at a specific time with the same wait staff, which is the classic way cruise ships have done meals forever. Or 2) "My Time" dining, where you go eat whenever you want. You have different wait staff each night. We did My time dining. My Time replaced the “Dynamic Dining” that preceded it, and we had and loved in 2016. Dynamic dining let you choose from different restaurants with different food options, but there were staples in each dining room in case you didn’t want what they were offering. However, they did away with this and now you get the same food in every dining room. They added a few “extra cost” options, like Filet Mignon as well. We did not like this new experience and this is why. First you end up in the same restaurant each night without being able to experience the different look and feel of other options. Secondly, the food itself varied from pretty good to mediocre. My wife and daughter had two meals they did not really enjoy. My meals were good. Others I talked to said they couldn’t stand the food and only did specialty restaurants. Not sure I’d go that far, but after two mediocre meals we decided to forgo the main dining room and augment with the two specialty restaurants, Solarium Bistro and the Windjammer. But what really irked us was that the entire feeling of the meal is rushed. Normally, they would take your dinner order, then after come with a dessert menu. Didn’t matter what sort of dining experience it was. Now they give you one menu. On the left is appetizers, the middle has the main course and finally desserts on the right. And they expect you to order all three upfront. I’m sorry, but I’m on vacation. I refuse to be rushed through dinner because it’s more efficient for them to do it that way. If the food was out of this world it might be a more minor issue, but It worked fine for decades on every cruise I&apos;ve ever been on the other way. I spoke to food service management twice about this. I hope RCCL changes this policy. Meanwhile I would recommend the specialty dining plan, even at the extra cost. The food and service are worth it, despite the minor issues we had. Activities/Facilities/nightlife The great thing about this ship is that during bad weather or winter sailings you can enjoy all sorts of indoor activities. There is an indoor family pool with child wading area, a solarium with multi-tiered pool and hot tubs for adults only (16 yo and up) and a large indoor seaplex with basketball, ping pong, gaming, bumper cars, roller skating, etc.. There is also a large outdoor pool and hot tubs and splash zone for the young ones. As with many cruises (on all cruise lines) people complained about lack of seating by the pools. We found this to be true. I take it with a grain of salt because it was a school vacation week, so there were 3x the kids and teens as usual, so the ship was packed. And I did see efforts by the ships pool crew to make sure there was no saving of seats. In fact if towels were left on seats too long, they were removed. There is also signage explaining this policy. So thank you RCCL for working on this issue. As for the bar areas, there were all sorts of cool lounges with entertainment. And let me tell you, RCCL reversed a trend towards less live music acts. This ship had at least 2-3 live music acts going at the same times around the ship. Boleros Latin themed bar had a great Latin band with dancing. The Schooner lounge featured live piano during the day and at night a comedic/singer Matt Yee. He packed the place. The pub had a singer/guitarist. And finally the Royal Swedes played in the Music Hall and other venues throughout the ship. These guys covered all sorts of rock, and they were one of the best bands I’ve seen on any ship. Of course there was also the ships reggae-themed band for poolside and even a Journey cover band that did shows (they were OK, I&apos;ll leave it at that). Overall music quality and options were great! The one thing we did notice is the live music seemed to end earlier than usual. By midnight most music was ending, and by 1AM the only music was the DJ/disco in the Music Hall. Previous cruises had the pub singer going to 1-2AM at least. But this is a minor complaint, because most nights we were pretty tired by midnight anyway. This could also just be because this cruise had a lot of families so they wanted to limit kids out and about late. Not sure. As for shows there are a couple full length shows, with our favorite being ‘We Will Rock You,” a somewhat odd Rock Opera featuring songs from Queen. The music alone is worth it though. There were also the typical offerings of comedians and other performers. The comedians we saw though were hilarious – especially the later adult shows. Overall RCCL and every other cruise line really have moved to a more A La Carte approach to cruising. More offerings for extra cost, drink packages, dining packages, special extra cost private island experiences, extra cost food items, “The Key” which give you some perks for boarding and show seating for extra money, etc.. As I see it, as long as the extra costs items give you a great product that’s fine, but it shouldn’t mean a lesser experience than normal for not taking that option – which I feel the main dining options have done. So overall the ship is great, music awesome and tons of dining options. And aside from the issues with main dining service, food quality and service was very good. OK, here we go. This is a detailed review. We are experienced cruisers and have been on many ships on different lines over the past 30 years. RCCL is the one we cruised with the most and are Diamond status, so we’ve had great and not so great experiences over the years – in both regular rooms and suites. This is our second time on Anthem of the Seas (you can look at our previous review from 2016). We heard a few complains here and there, but that is expected on a ship this large. We found overall the service to be very good. There were issues in the past with a serious lack of poolside servers, but that has been fixed apparently as there plenty of servers around the pool areas and the other public venues on the ship. The crew is eager to please and waiters go out of their way to make you happy it seems. Even in the Windjammer where they have staff that will get you drinks and quickly clean up after you. OK this one is a mixed bag, and the main reason for the 3 star review. Our experience mimics similar experiences on other ships. I am going to break this down as to be clear about how we feel about each type of food service. Windjammer Buffet – This in my opinion is probably one of the best I have experienced out of every ship I’ve been on. The layout, the offerings and the quality are outstanding. Yes there were some duds, but overall it is very well done. Eggs Benedict, smoked salmon and all sorts of baked goods in the morning. Great fish, carved meats and Indian specialties for lunch and dinner. Lots of fresh fruits and vegetables and salads. Seating can be hard to come by at peak times, but there are great floor to ceiling windows for a view and a nice outdoor area in the rear of the buffet. 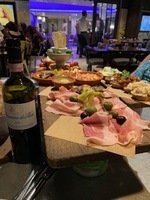 Specialty Restaurants – We dined at Chops Steakhouse and Jamie’s Italian, so we will limit our comments to those two. Jamie’s is excellent. Go hungry – very, very hungry. Definitely start with the charcuterie plank. It’s a long plank of deliciousness. The Lamb Chops are also terrific (Note: I ordered them rare and they came medium-rare/borderline-medium, so order one step less done than you want). Chops Steakhouse was the other specialty restaurant we went too, and is also terrific. They now offer prime aged steaks. I had the bone-in rib-eye and my daughter and wife had the Branzino. We splurged and ordered the seafood tower. A little disappointed in it and probably not worth the expense. The lobster on it was so undercooked that it was basically raw. Same with a couple of the shrimp (the fact they were black outside and not pink should be a giveaway). The waiter though brought us a new platter of lobster and shrimp to make up for it (note: the last night of the cruise the windjammer has the Jonah crab claws, shrimp, clams, mussels, etc. so you can get most of the ingredients for the tower for free then and skip doing it at the restaurant). But overall experience is great and these restaurant do not rush you. So give yourself 2 hours or so dining to truly enjoy. Solarium Bistro – Probably the least known option, and the best kept secret. This is like a mini windjammer and specialty restaurant combined. There is no extra cost for this dining scene which has great lunch and dinner. We went one night for dinner and they have a great buffet appetizer/salad bar. Main courses are varied, but they have a few extra costs options as well. I ordered the Lamb Chops ($10) which were thick and really good. But as I mentioned earlier, order less cooked than you want it. Mine were ordered rare and came out medium. I was going to send them back, but they were still soft and juicy. I enjoyed them despite the wrong cooking temperature. We also ordered the Maine Lobster for extra cost. This was not worth it. It’s small and extremely overcooked. Main Dining Rooms – Ok, this is where I have some major issues. You have two options. 1) regular dining at a specific time with the same wait staff, which is the classic way cruise ships have done meals forever. Or 2) "My Time" dining, where you go eat whenever you want. You have different wait staff each night. We did My time dining. My Time replaced the “Dynamic Dining” that preceded it, and we had and loved in 2016. Dynamic dining let you choose from different restaurants with different food options, but there were staples in each dining room in case you didn’t want what they were offering. However, they did away with this and now you get the same food in every dining room. They added a few “extra cost” options, like Filet Mignon as well. We did not like this new experience and this is why. First you end up in the same restaurant each night without being able to experience the different look and feel of other options. Secondly, the food itself varied from pretty good to mediocre. My wife and daughter had two meals they did not really enjoy. My meals were good. Others I talked to said they couldn’t stand the food and only did specialty restaurants. Not sure I’d go that far, but after two mediocre meals we decided to forgo the main dining room and augment with the two specialty restaurants, Solarium Bistro and the Windjammer. But what really irked us was that the entire feeling of the meal is rushed. Normally, they would take your dinner order, then after come with a dessert menu. Didn’t matter what sort of dining experience it was. Now they give you one menu. On the left is appetizers, the middle has the main course and finally desserts on the right. And they expect you to order all three upfront. I’m sorry, but I’m on vacation. I refuse to be rushed through dinner because it’s more efficient for them to do it that way. If the food was out of this world it might be a more minor issue, but It worked fine for decades on every cruise I&apos;ve ever been on the other way. I spoke to food service management twice about this. I hope RCCL changes this policy. Meanwhile I would recommend the specialty dining plan, even at the extra cost. The food and service are worth it, despite the minor issues we had. The great thing about this ship is that during bad weather or winter sailings you can enjoy all sorts of indoor activities. There is an indoor family pool with child wading area, a solarium with multi-tiered pool and hot tubs for adults only (16 yo and up) and a large indoor seaplex with basketball, ping pong, gaming, bumper cars, roller skating, etc.. There is also a large outdoor pool and hot tubs and splash zone for the young ones. As with many cruises (on all cruise lines) people complained about lack of seating by the pools. We found this to be true. I take it with a grain of salt because it was a school vacation week, so there were 3x the kids and teens as usual, so the ship was packed. And I did see efforts by the ships pool crew to make sure there was no saving of seats. In fact if towels were left on seats too long, they were removed. There is also signage explaining this policy. So thank you RCCL for working on this issue. As for the bar areas, there were all sorts of cool lounges with entertainment. And let me tell you, RCCL reversed a trend towards less live music acts. This ship had at least 2-3 live music acts going at the same times around the ship. Boleros Latin themed bar had a great Latin band with dancing. The Schooner lounge featured live piano during the day and at night a comedic/singer Matt Yee. He packed the place. The pub had a singer/guitarist. And finally the Royal Swedes played in the Music Hall and other venues throughout the ship. These guys covered all sorts of rock, and they were one of the best bands I’ve seen on any ship. Of course there was also the ships reggae-themed band for poolside and even a Journey cover band that did shows (they were OK, I&apos;ll leave it at that). Overall music quality and options were great! The one thing we did notice is the live music seemed to end earlier than usual. By midnight most music was ending, and by 1AM the only music was the DJ/disco in the Music Hall. Previous cruises had the pub singer going to 1-2AM at least. But this is a minor complaint, because most nights we were pretty tired by midnight anyway. This could also just be because this cruise had a lot of families so they wanted to limit kids out and about late. Not sure. As for shows there are a couple full length shows, with our favorite being ‘We Will Rock You,” a somewhat odd Rock Opera featuring songs from Queen. The music alone is worth it though. There were also the typical offerings of comedians and other performers. The comedians we saw though were hilarious – especially the later adult shows. RCCL and every other cruise line really have moved to a more A La Carte approach to cruising. More offerings for extra cost, drink packages, dining packages, special extra cost private island experiences, extra cost food items, “The Key” which give you some perks for boarding and show seating for extra money, etc.. As I see it, as long as the extra costs items give you a great product that’s fine, but it shouldn’t mean a lesser experience than normal for not taking that option – which I feel the main dining options have done. So overall the ship is great, music awesome and tons of dining options. And aside from the issues with main dining service, food quality and service was very good. 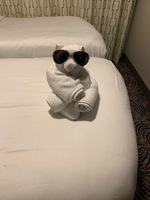 On this cruise we opted for two connecting balcony rooms on deck 11. One room is very tight for two adults and two kids – as we discovered last time. So this time the two rooms worked out great. Two bathrooms (with a teenage girl and a 10 year old…a must) There is plenty of storage under the beds for suitcase and two large wardrobes for clothes and hanging items. This ship has very spacious showers for a cruise ship btw. The only thing about that is the shower has a clear glass surround, so when the bathroom door is open you can see anyone in the shower. Not great if the kids are in your room and your wife opens the door…just saying. Since we had two rooms the room attendant opened up the balcony divider so we basically had one large balcony. So on Embarkation they have greatly improved the port over the years with plans for further improvements as was hinted to us. However, when you enter you still get stuck in a long line of traffic that takes 20-30 minutes to get to the unloading zone. After that, parking is right there in a garage next to the terminal and check-in is simple. The private island is very nice, although a lot of construction for their new expanded waterpark and attractions makes the island look unappealing from a distance. We splurged for a bungalow. Includes lunch brought to the bungalow, floats, a private beach area and waters in a cooler. No fighting to find beach chairs. Worth it to us. OK Nassau has been described as the Newark of the Bahamas. I wouldn&apos;t go that far, but it is built up and it has a reputation for crime. So probably don&apos;t wander off into unknown areas. We go to Junkanoo Beach. A crowded public beach and bar area about a 10 minute walk from the pier. The worst part is navigating the relentless cab drivers, tour operators, vendors and other "pushy" people. This is your port for going to Disney, Universal, etc. Our favorite place though is Kennedy Space Center down the road. And this time we took and Uber to Cocoa Beach. NOTE: The ship has a shuttle to Cocoa Beach. It&apos;ll cost you $100 give or take for a family. Uber is waiting at the pier and costs us $13.